The European Space Agency’s Herschel Telescope has detected water vapor around Ceres. 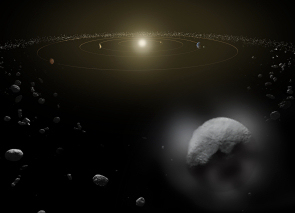 Ceres is a dwarf planet that hangs out in the asteroid belt between the orbits of Mars and Jupiter. It is the largest object (diameter of 950 km or 590 miles) in the asteroid belt and is almost spherical in shape. It was first discovered in 1801 by Giuseppe Piazzi, and was classified as an asteroid. However, it was reclassified as a “dwarf planet” in 2006 because of its larger size. This is the first time water vapor has been detected around an object in the asteroid belt area. 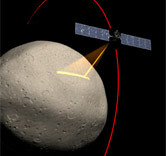 NASA’s Dawn space probe is currently on its way to Ceres and will start orbiting the dwarf planet in early 2015. Dawn left Earth in 2007, and made its way to an asteroid called Vera in 2011. It orbited around Vera, and left Vera for Ceres in 2012. Here is a video about Dawn’s mission.